Looking for that perfect place to relax and unwind? Gecko@Sea is the ideal holiday home, situated in Trafalgar on the lower KZN south coast. This well-equipped house offers relaxing self-catering accommodation that can comfortably accommodate up to 8 guests and comprises of 3 bedrooms, 2 bathroom, an open plan kitchen, lounge and dining area. The main bedroom has a queen size bed and is en-suite with bath and loo. The second bedroom has a double bed and the third bedroom has 2 single bunk beds. They share the second bathroom with a loo and shower. The kitchen is well equipped with a microwave oven, fridge, freezer, two induction stoves, an eye level oven, as well as all the smaller appliances one may need. 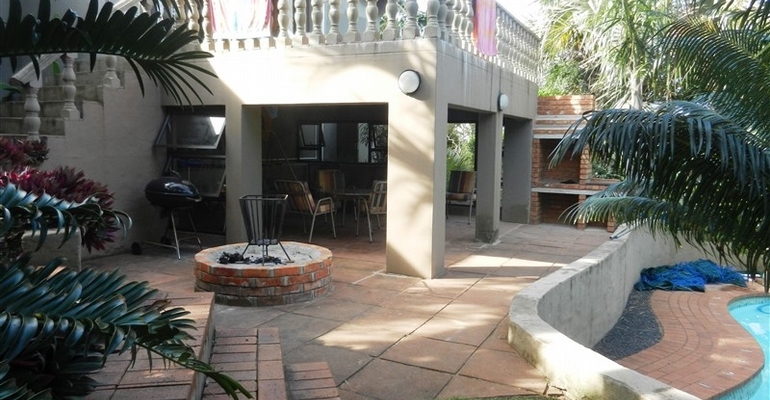 There is a large open veranda overlooking the garden that has a built-in braai, undercover stoep and swimming pool to relax in on those hot South Coast days. The house has 1 garage with ample additional parking. Your fur kiddies are also welcome with prior arrangements. We are 900 meters from the bathing beach and there is variety of activities close by such as Wild Coast Sun Casino, Wild Waves Water park, Mac Banana, golf courses, deep sea fishing trips and so much more. Indulge in the beauty of our natural surroundings, including our famous blue flag beach, abundance of bird-life and bush buck wandering the bottom section of our garden. Or relax around a bonfire at night. Come and enjoy warm winters or relaxing summer holidays in a secure and privately-owned house. Out of Season: Starting from R1050.00 per night, minimum 2 nights stay. In Season: Starting from R1350.00 per night, minimum 3 nights stay.